Yep! I almost gave up on my blog late in 2014. I was getting a little frustrated with visiting some of the more popular blogs, seeing comment after comment on their posts. Some of these posts had 30, 40, or 50 comments. These were the posts that hadn’t even gone viral. I kept wondering what’s their secret? How in the world do they get so much engagement on their site? The better question was, how can I go about getting that level of engagement on my site? Then it hit me. When I took the time to actually read these posts with all the comments, there was a common theme. So I decided to give it another go using some of these new found secrets. What I found was this blog networking thing actually seemed to work. In a simple word, networking is interacting with others. Every profession does it to some degree, so why wouldn’t you apply this same principal to blogging? Networking is meeting new people, interacting with people you’ve previously met, creating new friendships that will help you grow your business. Blog networking is how you create engagement. Know why these other bloggers have so much engagement on their site? They’ve learned how to network. Some of them have been doing it for years, others have just recently started. And it always works. Blog networking is the secret sauce to having engagement on your site. When I started out blogging, I was going about things all wrong. I wrote my posts for the search engines. Yes I was writing content for a human being, but my focus was on finding that traffic via Google. I was somewhat successful with this approach, and I was seeing an increase in traffic to my site. But one of the things I was missing was a level of engagement. After doing some research and reading a few posts from some successful bloggers, I had an epiphany. The common theme I was seeing across a number of these successful blogs were posts on networking, So I decided to give it a go. I started this little exercise in early December 2014, and I immediately saw an increase on the level of engagement to this site. In the past month I’ve had more than double the number of comments as I had in the first 10 months of this blog. In other words, I saw a 200% increase to the engagement of my site in just over 30 days. I’d say that’s working. Blog networking comes in various shapes and sizes. There isn’t one set answer, the best solution is do what works best for your blog. With that said, this is what is working for me. It all starts with targeting the right bloggers. There are a number of different ways to find influencers within your niche. If you have no clue where to start, we’ll need to start with the basics. Head over to your favorite search engine, and start doing a search for keywords that are specific to your niche. Focus on only the first page of the Search Engine Results Page (SERP), and record the blogs that appeal to you in a spreadsheet. Continue to do this until you have a list of 10 or so bloggers in your spreadsheet. If you already know one or two popular blogs within your niche, than you’re ahead of the game. While you may think these blogs are out of your league, a little analysis of the blog comments will reap huge networking benefits. What you want to do is start looking through the comments of the various posts on the blog. Pick a post and make a mental note of the individuals that are commenting on that post (you don’t even need to read the comment – at least not yet). Move onto the next post, and look for those same individuals that left a comment on that post. You’re looking for the bloggers that are leaving multiple comments on the blog you are analyzing. These bloggers will become your blog networking targets. You’ll want to add 10 – 12 individual bloggers to your spreadsheet. This spreadsheet is your blog network target list. You can add some other fields to the spreadsheet to help you identify more information on the blogger you’re networking with. We’ll explore that in more detail in a later post. You’ll want to visit the blogs in your networking list on a regular basis, to review their latest posts and leave a comment. Not just any comment, but a comment that will get you noticed and add some value to the post you just read. Anyone can write “great post”, but if you really want to get noticed your comment needs to stand out. The first time you comment on someone’s blog, tell them so, and let them know you how much value you find in their blog. Your comment should call out one or two items in the post that you agree or disagree with, and go on to state why. Finally, when wrapping up, let them know you’ll be back on a regular basis. To really stand out, don’t just limit your comment to one or two sentences. Go crazy. I’ve seen some comments on blogs that go on for paragraph after paragraph. The thing is, don’t ramble, and be sure everything is adding some additional value to the post. You’d be surprised at how many other bloggers read every single comment on a post. If you really like the blog, sign up for their email list. Everyone likes seeing their posts shared, so be sure to share the posts of the bloggers in your network. This is extremely easy to do. Everyone has share buttons on their blog and they can be easily found at the bottom of every post or along one of the sidebars. If you like a post, share it! Heck, you can even add your own little commentary to the share to make yourself really stand out to the author. I like to use an application called Buffer. This allows you to queue up a number of shares if you find that you don’t have the time to read blog posts every single day. You can create you own custom schedule on when these shares are sent out via Twitter or Facebook. Best of all, it’s free. While we’re speaking of social media. If someone share’s your post and mentions you, be sure to thank them. A simple thank you goes a long way to getting you noticed. If someone leaves a comment on your blog, be sure sure to respond to that comment. Engagement is a two way street! Don’t stop there! Hop on over to their blog, do a little bit of research on the person that just left you a comment. Heck, you might find a new favorite blog. If so inclined, leave them a comment on one of their posts. You get the idea. It’s called reciprocation. Easy concept. Here’s the thing to remember. Just because another blogger left you a comment, there’s no requirement or obligation on your part to do the same. If you like the blog great, if not, just move along. The key word here is on a regular basis. Don’t feel the need to visit each of these blogs every single day. The key is visit often enough so they can remember you. I try to make my rounds once a week. If a new post doesn’t strike my fancy, or I don’t have anything that will add value to the conversation, I move on. Just be sure you are making regular contact. This is a great one that can really open some doors for you. I’ve had a number of email exchanges with some key bloggers that up until recently, I never imagined would happen. It all started with me signing up for a bloggers email list. You’d be amazed at how many bloggers want to hear from you, and actually ask you to shoot them a quick email telling them something about yourself, or what you want to get out of their blog. If you don’t want to sign up for their email list, send them a quick email after you’ve established a connection. Don’t ask for anything, just let them know how much you appreciate their blog. Some great email exchanges have developed from this strategy, and you may just get some free advice on your blog. It’s happened to me on multiple occasions. Now that you’ve seen what I’ve done to increase engagement on my site, the ball’s in your court to do the same. Why not start now. Leave me a comment and start your blog networking right here. I think you’ll be pleasantly surprised at how easy it really is. And in case you’re wondering… I started (re-started) this blog to show you what implementing a strategy can do for your blog. Don’t blog aimlessly, put a strategy in place today. Better yet. Just click here! I’ll share with you the results of my strategy on a monthly basis, and give you an in-depth look at the things I’m doing that are working for me. What an excellent post, and thank you so much for the kind mention of my back scratching article, I appreciate it. Your points are all great, and I agree with every single one. You’re absolutely right, networking and building relationships with folks is the secret sauce! There are many levels of networking, however, depending on the lifecycle of your business. I’m so happy that you experienced a 200% increase in the engagement of your site – that’s fantastic! Certainly wishing you a continuation of that process of increased success. You’ve worked hard, that’s obvious. Well that’s quite the compliment, thank you Carol. Appreciate your kind words, and enjoy the rest of your evening as well. Engagement is so critical to any blog looking to become established in 2015, both to audience retention and also to SEO. I really like the idea of returning the favour, something with which you even did for me recently! I always respond to comments, but rarely make the trip over to someone else’s site to leave them a comment on their own website also. This is a great networking method. I actually hate the term networking. It seems that instead of making ‘contacts’ you’re often actually making friends – as sad as that sounds! – ‘networking’ makes it sound so formal! As for returning the favor. As you recall, that’s how i discovered your blog. Now look whats happened, multiple comment exchanges between us. Possibly the start of a new networking, I mean online friendship. Thanks for taking the time to leave a comment Luke. See you over at your blog. I’m new to your blog and first off I saw your title on Andrew Warner’s site via his comments and I had to take a look! Well done Sir! I’ve been an entrepreneur and have built all my businesses on a combination of offline and online networking. You are absolutely right, it works when we bring value to others first. I network via the best comments I can offer on other blogs, shares on social media that are as engaging in the post as a comment (but more concise), and by sharing great posts or bloggers via links inside my blog when it makes sense to do so. Those initial strategies were HUGE for me, so much so that in six months I’ve been blessed with an incredible community of influential bloggers around me. Last week I had my first contributor post on SEMrush.com. Because of the networking and relationships I built online I was able to reach out to over 20 bloggers personally and ask them to support me. It was huge. That post has been one of the biggest to date with 185 Google+ shares, 77 Facebook Likes, 110 Tweets and 39 shares on LinkedIn. That doesn’t count all of the activity on Stumbleupon and other shares. Here is the cool part, there are 75 comments and most of them are from my community. They were so impressed they asked me to be a regular contributor. Absolutely it works if you take the time and energy to build it the right way. Many in my community have become friends who not only send me traffic but also business referrals. The key is it requires building the relationship. I actually spoke about this subject directly in my article on SEMrush and in blog a bit yesterday. Thanks for a great post Craig and congratulations on the increased engagement on your site. I’ve bookmarked your blog and I will be back to check out more of your content. Thanks for the kind words Don, and thank you for taking the time to stop by my blog and check things out. I hear what you are saying. These simple strategies like commenting and sharing posts can lead to some amazing relationships. I to have been blessed with building some great relationships with some truly amazing bloggers. I still cant believe some of the names that are commenting on my posts. Don, you are a perfect example of what networking can do for one’s blog. I’ve seen your name on many blogs that I have commented on, but haven’t had the time to make my way over to your site yet. But here you are, checking out this blog and leaving such a great comment. Amazing to me! I will see you over at your blog. Thanks again Don! Networking really is important and is something that would be done by anyone looking to bet into blogging or business in general. When it pertains to blogging, how can you NOT network. What I found out was that blogging was unlike any other type of “business”. The most successful bloggers in the world got to be to that point by networking with others, so I find it truly disappointing when I hear a newbie blogger say they’re going to try to do it on their own to prove their independence. Anyway, I like your tips for the networking strategy. Especially analyzing the blog comments. Funny enough, that’s something I planned on doing when I took my break in December. I wanted to do just that and network with new people. I’d found a popular bloggers site and had a list of 20 people that were religious commenters and I was going to network with them, check out their site, etc. But I didn’t get around to it. But I like the strategy. The return the favor thing is something I really want to do and I’m starting to do more of. I already have my group of bloggers that I already follow and leave comments on their sites, but to those I’m not familiar with, I want to return the favor and show my appreciation for the time they took to leave a comment on my posts. And to tie that in with your other point of making contact on a regular basis, that’s what I want to do. Thank you Andrew! Networking is something I do all the time in my day job, and it’s an important aspect of my work. Sad to say it took me a while to figure out that same principal applies in the blogging world. You’re right, blogging is unlike most other businesses, I’m actually planning a post on that. That should be kind of fun. Returning the favor is working out for me. I’ve discovered a number of other bloggers that I wouldn’t have typically come across. So that has paid dividends for me. Thank you for the kind words, and I’ll be seeing your around. Thanks for your tips. Some I was already using and some are new. Networking is key. I recently had my Twitter account hacked and deleted but found that it was blessing in disguise. Now I have a growing list of authors, writers, and bloggers who are networking and are also retweeting my blogs. Also I use Buffer too and it is good. Thanks for commenting Susan. Twitter account hacked, that’s horrible, but I’m glad it worked out for you in the end. Networking is key – you nailed it. I mean just look at the comments I’ve received on this post. None of that would have been possible without my networking efforts over the last 45 days. Bloggers are always supportive of other bloggers and love to check out their posts. But that is only possible when they know that you exist. This is where networking helps. Thanks Uttoran. You nailed it. These other bloggers need to know you exist and the best way ive found to do that is commenting. It really does work. Wow a 200% increase in the engagement on your site. That’s amazing and proof that it really doesn’t take much. I know some people complain a lot but are too scared to step outside their comfort zones and start visiting other blogs, seeing what people are sharing and start interacting with them. That’s all anyone really wants I believe. We all want to know that our content is helping others and when they give us their feedback through the comments then that’s what we’re looking for. Having it read, commented on and shared is why most of us blog. I remember being intimidated myself by some of these very successful bloggers and not understanding their secret. I think I worried too much about it so instead I just decided to take that leap of faith and put myself out there too. Imagine my surprise when I started getting some of the same great responses. That’s all it really takes. The people you meet while blogging can become some of your most dedicated supporters and friends. Just as Don shared above, he can reach out to his network of people and they’ll support him. I’ve sent him a referral that is now working with him because I know he’s that good. All because we made that connection and it started with blog commenting. I’m glad you laid all of this out there in this post and I’m happy that you didn’t quit blogging. I have a feeling yours is going to explode this year and I intend to stick around and watch. Have a great day and week Craig and I wish you the very best. I know, can you believe that? You’re right, it really doesn’t take that much work. If I would have published this same post 2 months ago, I wouldn’t have received one comment. I’m convinced of that. Now look at the people that left comments just today alone. I still can’t believe it. My phone was blowing up all day with all the notifications I was receiving. And it all started with a single comment, just over a month ago, and I believe it was on your blog. I could never bring myself to comment on these successful blogs that I was reading from time to time over the last year, just didn’t think it was all that important. I laugh at how silly that sounds now. Thank you for the wonderful compliment Adrienne, and being such a tremendous help to me. You’re correct! Networking does work online as well as off. I relate to how well it works with blogging because I took my blog from a 1 million Alexa ranking all the way down to 200,000 within a year. As you may or may not know – the lower the Alexa number (ranking) is, the better it is for your blog statistics. I even did a case study showing how I achieved these results over the course of several months. I blogged daily and also visited the blog owners who visited my blog to comment. The problems started when I couldn’t visit them as often as I had in the beginning. I had a truck accident that took me out of commission for the last three months of 2014. Sadly, it didn’t take long for my blog to start suffering from my absence. Naturally, the decline in daily activity meant my blog numbers weren’t as great as they once were. The 200,000 Alexa ranking soon turned to 400,000, and now it’s back to an embarrassing 777,000. I know with networking my blog will make a swift comeback. That’s one of the reasons why I joined Carol and Adrienne’s blog tribe. It was an honor to receive an invite too! I enjoyed this post, Craig and anticipate reading more of your insightful prose. Keep up the good work and please do visit my blog when you have a chance. I would love to get to know more and how we can work together to serve others! Hi Bonnie – Great having you here and thank you for taking the time to comment. It’s amazing what some simple networking can do isn’t it? It still amazes me how beneficial such a simple concept is. In the reply I just left to Adrienne’s comment, I mentioned that I doubt I would have received one comment on this post if I had published it 2 months ago, before I started focus on my networking. I have no doubt that your networking efforts will make a huge impact. I’m looking forward to seeing you around, and I will absolutely make it over to your blog!!! Glad to hear you held through and didn’t give up when results weren’t coming right away. This is a mistake I sadly see a lot of people make so the fact that you kept pushing really goes a long way to show your mindset towards blogging and shows that you’ve got what it takes to succeed. Your results from networking so far have been awesome and I know if you keep it up you’ll only continue to grow further. I’m also extremely glad to hear that you’re no longer blogging for organic traffic as well. Not only does this traffic tend to convert horribly, but it puts control of your business into another company’s hands – something that needs to be avoided at all costs. So many people think that ranking high in Google equates to instant success and it frustrates me to no end because it’s not true at all. Blog commenting (which leads to more serious networking) is one of my favorite traffic generation strategies and it works extremely well. I’m glad to hear you’ve adopted this strategy and that it’s working for you too. Keep up the great work Craig, you’re going places! James – Nice seeing you again! That’s what they say isn’t it, most blogs fail (I almost wrote flail) because the blogger gets discouraged. Very easy to do. Organic traffic is overrated. 🙂 Sure it’s fun trying to outrank someone and work your way to the top of the SERP’s, but that really didn’t get me anywhere. I think there’s still a time and place for it, but that’s definitely not my focus right now. And you’re right, who would want to put control of their business in someone else’s hands. Thanks for the great compliment, and I’ll be seeing your around. Great post and a great story – I’m delighted for you. I agree so much with what you say about reciprocation. Just because someone leaves a comment on our post, doesn’t mean we need to go over to theirs and leave a comment in return. I will only do this if the site in that has left the comment first and foremost offers me value. So I’ll go and take a look, and see what sort of content they put out. If it’s of value, and if I can add value, I will return the comment. Now, networking. I didn’t realise that this networking thingy was an integral part of blogging when I started the SID blog 2 years ago. I wish I had known sooner! The key for me Craig, is to netwrok with the right people. Build meaningful relationships. Build those meaningful relationships with people who you like, who you have gotten to know and who you can trust. I say this all the time, but for me, I’m just as invested in the blogger behind the blog as I am in the content that the blogger puts out on their blog. For example, I’m here. I’m here becasue I like your content, and I also like you as a person and as a blogger. I see too many people these days trying to fake relationships with others (where they are not interested in them or their content, but only in what their status/position can get for them) just so they can piggyback off them and get something in return. For me, it’s the wrong way to go about things. Cheers Craig, have an excellent weekend. I like how you put that Richard – this networking thingy. It really is an integral part isn’t it. I had no idea. This could have saved me so many headaches in the past. Thank you for the compliment and stopping by again. I know what you mean about seeing others with so much success. It can be a little of a downer depending how you look at it. Sometimes I get a little frustrated and look at it the wrong way but luckily I work hard to bounce back quick in those situations. Networking is huge. I like what you said about reaching out via email. That is something I added to my strategy this 2015 for sure. It takes much more effort to send a email and people notice. I enjoyed the post and can’t wait to see what else you have for us! Thanks Steven, appreciate you stopping by and taking the time to comment. Definitely have been frustrated with blogging in the past. As Richard stated so well, this networking thingy really does work. Wish I would have figured this out years ago when I was first getting started. I am not really sure how I missed out on this post especially when you gave me such a wonderful mention. I just finished reading Carol Amato’s post on WP Curve and then a pingback link hit my blog, lo and behold is the link to this post. Anyway, what matters right now is that I am here isn’t? 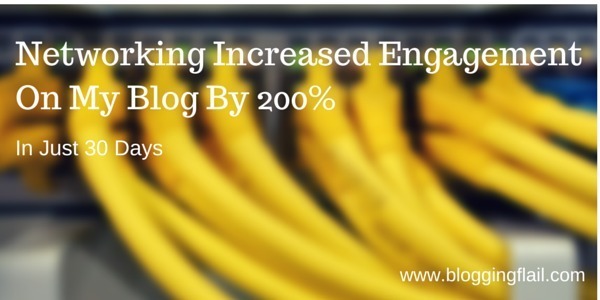 My oh my, 200% increase in blog engagement? That’s something to be proud of Craig. Believe me I know how this feels because I too experienced such last year. It’s so demoralizing when you see comments hitting on blogs you read and none on yours, it takes only passion to continue in the race. Yes, nothing works like fire than blog relationship and networking. Last year, I invested heavily in blog relationship and it’s one thing I am proud I did Craig. Sometimes when I look back to see the things I have achieved following my decision to invest in blog networking and engagement blogging I feel like doing even more of it! Your post is really timely and I can relate the reasons why you hit the success line Craig! More of it is coming your way this year because you have finally joined the crew of folks who leave their comfort zone to achieve greater things! Have a wonderful week ahead Craig. Thanks for commenting Jackson. I need to apologize, I should have let you know that I linked to you in this post. I really thought I had done that, but apparently I did not. My bad. I need to work on this. I’m glad you liked this. I know you get it, and you preach this on you blog. It’s amazing how some simple networking can go such a long way in building new relationships. I’m still amazed at how easy of a concept this is. “Broke the yoke on no blog engagement”, I really like that quote. That could be a great heading for a new blog post. Thanks for the kind words Jackson, and I’ll be seeing you around. You share really great stuff here and thanks for this practical experience. Networking in blogging. I keep saying that no one can succeed as an Island. Every great blogger has a community and once you are connected with others, you find them hanging around your blog and promoting it. One thing I have discovered is that the best way to network is commenting and then promoting others on your blog. Now, you just demonstrated that in the post. You linked out to a couple of bloggers and their owners are excited to be here to engage and share this post. Isn’t that awesome? Thank you Enstine, appreciate the kind words. You’re right, it is awesome. I sound like a broken record, but it’s all to easy. Leaving comments on other blogs, promoting content, linking to others. It so amazes how appreciative everyone is because of this. I know first hand about not succeeding while being on an island. This blog is a testament to what can happen when you start networking with others. Thanks for taking the time to comment Enstine, and I will be seeing you around.